Off-Centre Circle charts the journey of a young football obsessive from kicking a stuffed sock in his hallway as a child right through to togging out for an over-33 summer soccer league in the 2009 season. Every week thousands of men, women and children up and down Ireland take to their local football pitches to compete in junior soccer league leagues and competitions. There are no Arab Sheiks with tons of money to invest here or after-match interviews with Sky TV. In most cases you will be fortunate to find facilities such as dressing rooms or even functioning shower facilities. Yet for 90 minutes every weekend Irish amateur soccer league players take to football pitches the breadth and length of the country and give it their all as if it was every bit as important as any English Premier League match and their lives depended on the result. Where does a love affair with the game of soccer begin? What makes people play through the pain barrier for absolutely no financial gain? Why go through weekend after weekend of strange refereeing decisions, atrocious weather conditions and being embarrassed by opponents half your age? Pride, passion, love of the game, and downright obsession, thats why. 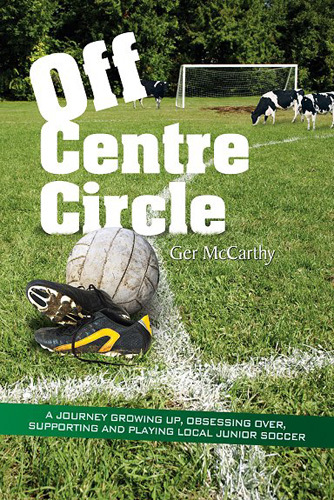 Ger McCarthy's new book opens up the the life of a junior footballer with his own reminiscences and memories of training, playing, obsessing, writing about and crying over his passion. Ger tells about his consuming fascination with football from childhood through his adolescence and climaxing in the tale of his local club's rise to pre-eminence in the West Cork Soccer League. Born and raised in Cork the Ger writes about his earliest memories of watching Match of the Day on the BBC, playing table soccer - Subbuteo, reading Roy of the Rovers comics, and supporting his beloved Cork City in the Shed end of Turners Cross, chanting and singing with the other City supporters. Ger's book also deals with the authors earliest playing days, making the breakthrough into his local junior team for the first time - and then fainting. Playing football matches on mountains slopes with on cow manure-speckled pitches. He also recalls going toe-to-toe with former Wimbledon hard man Vinny Jones on the Late Late Show on RTE, and helping his local club to rise from the lowest rung of the West Cork League to success in the Beamish Cup. Anyone who has ever donned a pair of football boots at the side of the road and trudged on to a sodden soccer pitch (maybe after a few beers the night before) to represent their local club will immediately relate to the stories and characters outlined in Off-Centre Circle. If you have ever wondered what makes a junior / amateur soccer player continue playing well past their best-before date will find out the reasons why. Perhaps you have read other football books telling you stuff you already know but Ger's new book gives you a different perspective of junior soccer in Ireland. Ger McCarthy is a football obsessive and is frequent contributor on local and international soccer to the Evening Echo, the Southern Star and the West Cork People newspapers as well as the award winning Cork City FC match day programme 'City Edition'. Based on the cajoling of team mates, referees, supporters, doctors and indeed complete strangers, Ger eventually declared his retirement from regular playing duties following a junior soccer career that spanned much more than a decade. The 2009 West Cork League junior soccer campaign represented his 5th consecutive year of coming out of retirement. During the course of completing his book Ger sustained a dislocated shoulder, a torn tendon as well as two broken fingers. He cant wait for the new season to start !